The School of Art at Kyung Hee University decided to devote its efforts to transforming the alleys around the university by painting a series of compelling posters with strong messages that call out to the passer by. The posters are remarkably effective. Here are a few examples. 2012년 6월 7일 예일대학교 동아시아 언어‧문학 존 트리트 교수님 (일본문학전공) 께서 경희대에서 예일대 학한국 전망 관련 해서 특강 하셨어요. 명문 예일대학교는 아직 한국학이 없는 이유를 설명 하시고 예일대와 한국의 인연을 소개 하셨어요. 교수 하고 학생과 매우 유익 한 문답도 하셨어요. Professor John Treat of East Asian Languages and Literature at Yale, my original department and the department of Professor Steven Owen at Harvard University, delivered this talk to a group of Kyung Hee students and faculty on June 7, 2012 at the Kyung Hee University library. East Asian Languages and Literature at Yale is the most solid program for learning Asian languages in the United States. Because the program requires undergraduates to take a course in either literary Chinese or literary Japanese, it has never attracted a large number of students. In my year, 1987, there were four majors. 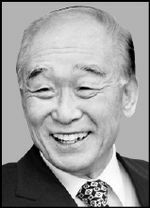 This interview on the Korea Scholarship Foundation Blog concerns important issues in education today. This article in the November, 2011 issue of “Christian Thought” (기독교사상) includes a rather lengthy interview in Korean. Emanuel gave a talk about a memory dream he had about his grandmother when first studying in Korea at the recent TED event. Hongreung is the name of an old neighborhood (named after a royal grave) in northern Seoul that has become the center of a research cluster defined by Korea University, KAIST, KDI, Kyung Hee University Hanguk Sook of Foreign Studies and KIST. Actually, the place., “Simple Waffle,” only serves vegan waffles so far, but the owner, who goes by the name Pooh Lee, has great ambitions. Vegan food is hard to find in Korea, and I think a true Vegan could starve without some help. I stick to vegetables myself, but commonly you find a taste of meat or fish in just about everything. So it is impressive that there is now a place that calls itself Vegan near Kyung Hee University. In Korea, oddly, eating meat is associated with being modern. Just like throwing away paper cups is somehow “modern.” I love Korea, but this cultural assumption is one of the great challenges. Kyung Hee University and the United Nations hosted a remarkable event entitled “Give Peace Another Chance” to commemorate the 30th anniversary of the establishment of the United Nations “Day of Peace.” The “Day of Peace” was originally proposed by the founder of Kyung Hee University and it was most appropriate that the United Nations chose Kyung Hee University for this event. 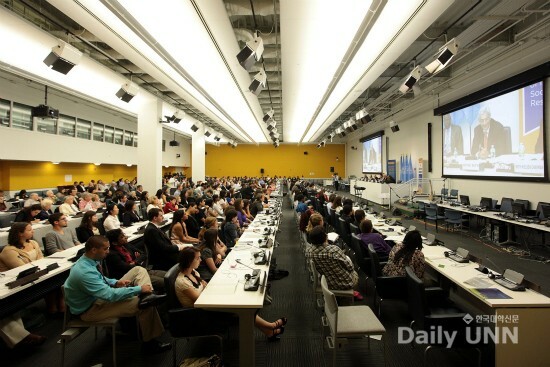 The event, which included speeches, statements by students, an address by Secretary General Ban Ki Moon and music performances, was split between United Nations Headquarters in New York City and Kyung Hee Campus in Seoul. Both groups were linked up via the internet. More than 3000 students from ten universities were involved. The event was focused on United Nations Academic Impact (UNAI) an innovative program to increase the global role of universities and the commitment of students to proactive participation in local and global affairs. Academic Impact aligns institutions of higher education with the United Nations in actively supporting the then principles of the UN in the areas of human rights, literacy, sustainability and conflict resolution. The Academic Impact also asks each participating college or university to actively demonstrate support of at least one of those principles each year. Secretary General Ban Ki-Moon’s address to “Give Peace Another Chance” is available here.